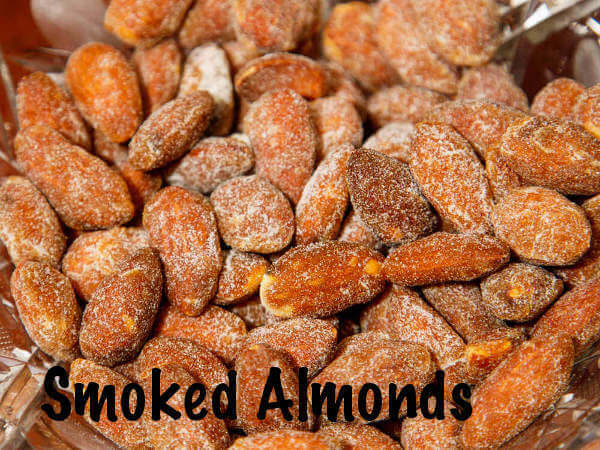 Smoked Almond Recipe Is SnackTastic! If you like almonds, this smoked almond recipe will make you a happy camper. With a few ingredients, and a little time, you can have your own homemade smoky nuts. Melt the butter in a skillet, add the almonds and stir. Remove from heat and cover. Stir a bit every minute or so for 10 minutes. Place the salt, sugar and onion powder in a spice grinder, clean coffee grinder or blender and pulverize until it becomes a fine powder. The finer the dry ingredients, the better they'll stick to the almonds. Smoke at about 225 degrees with a light flavored wood like apple or alder until the nuts are lightly toasted. Remove and allow to cool. Store in an airtight container. This smoked almond recipe makes about two cups, which can go pretty fast. Better make a double recipe!